Theres never been a greater amount of choice in terms of your windows to the world wide web. With so many browsers to choose from its interesting to ask the question as to what makes someone decide upon one in particular. In most cases the average home user probably doesn’t spend a huge amount of time thinking about it. Most people will simply use the default browser that came preinstalled on their computer anyway. So on a windows platform they’ll simply use IE, on a Mac Safari will suffice and on Linux its most likely Firefox. Lets be honest about it, whether you choose Chrome, Opera, Safari, IE, Firefox, Lunascape, Avant, Maxthon, Deepnet Explorer or Flock by and large your web surfing experience won’t deviate dramatically. After all, your still using the web for the same purposes, be it research, communication, entertainment, shopping etc. However its the subtle differences between them and the individual feature sets that makes one stand out from the rest. That said, some browsers offer greater support for plugins, improved performance for things like Java and Flash, HTML 5 and many websites work better with certain browsers. Firefox is a fine all rounder, scoring well in most benchmarks and provides a comprehensive range of features, including Parental Controls, Anti-Virus and Anti-Malware detection, solid Anti-Phishing, Firefox is updated a total of 48 times per day with information about fraudulent web sites. This allows you to stay that little bit safer when buying online. It also has its own private browsing feature. I really like its tabbed interface and its support for third-party add ons. IE will remain a mainstay for many Windows Users. It probably has the most amount of support, as one would expect given its popularity. Oddly its homogenous exclusivity to Microsoft Windows hasn’t negated its advantage. It seems Redmond are determined to keep it within their own eco system which is a shame, IE 8 has gone a long way to provide users with a stable and easy to use UI with impressive security elements and strong Flash performance. It now includes tab isolation and crash recovery, along with support for HTML 5 and CSS3. It would make a fine edition to my Mac’s arsenal of browsers but sadly we’ll probably never see it set free from the Windows sandbox for other operating systems to play with. IE 9 is currently in Beta, so far reviews seem positive, it seems to finally match the Aero theme look and feel of Windows 7 while allowing you to see more web page. It appears Microsoft have been listening to their users after all. Chrome is fast becoming the most popular browser, right up there with IE. It was only a matter of time before Google released a browser of their own and given its success its no wonder a spin off OS is in the works. It features dynamic tabs, It’s among the safest to use thanks to its unique security features including auto-updates and Sandboxing, which prevents malicious web sites from installing Malware on your computer. It also has impressive crash control, themed add ons, and a great full screen mode. Whats more google search is built right into the address bar and I personally like the fact that the favicons for your bookmarks are displayed along your menu bar at the top of the page. It gives it a nice custom graphical feel. It’s aforementioned Incognito mode is easy to start and use. 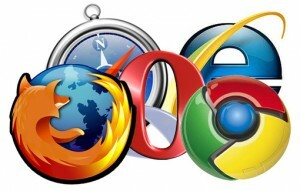 Overall, theres a web browser for every user and every occasion. For some of you who have stuck with one for your entire surfing life so far its worth taking a test drive with something new. With the exception of IE, most browsers we’ve discussed above are available across all OS platforms so visit the developers web site and download one. Their completely free and each one offers unique features, many of which may be suited to your needs. In my view its always worth having more than one or two browsers installed. Occasionally I have issues uploading videos to Youtube in Safari due to some Caching problems, its clearly a maintenance related issue. However when I switch to Firefox or Chrome it starts working again. If for nothing else its worth having a contingency. Like I said at the beginning of this article, a web browser is your window to the world. Make sure you’ve got the best view. I prefer Chrome because it’s faster and I have used everything from Opera to Safari. I was a die hard Safari fan,then firefox fan, now I’m a sold out Chrome fan. It’s just faster than most browsers but Safari 5 is getting there in terms of speed. I am a new MacBook Pro 13″ (Feb ’11) user and I love Safari. It’s so fast. I still have my Dell Inspiron, I just never use it.. I never really liked Internet Explorer for everyday use, and was a big Google Chrome fan. I’ve definitely taking a liking to Safari.. it’s quick, stable, looks good.. and definitely not laking anything. Despite the much documented potential privacy issues, I’m quite fond of Google Chrome. However I find I’m pretty much stuck to Safari because its ability to sync bookmarks via MobileMe across my Macs and iOS devices is a feature I wish to use, which unfortunately rules out Chrome. Safari is still a great browser though ! I like Google Chrome the best because it´s fast it looks good and it has a verry small top-bar. I used Firefox for years, but enough was enough, it’s a huge resource hog. So I finally switched to Chrome late last year. I love the minimalist layout and the combination of the Google search box with the address bar. It’ll take a lot to get me to leave Chrome now, although I’ll definitely have a look at the stable version of Firefox 4 when it’s released. What browsers are good for the iPad? I am pretty sure I will be investing in an iPad2 when they come out in the UK, and later buy an iMac, when the 2011 version comes out. I know you are not a fan of tablets running mobile operating systems at the moment, but will there be more content for the ipad on this site? Also, will there be an iphone version of computingforever. Sorry for all the questions, and by the way, fab site. I recommend Mercury because it’s a dollar and it has a neat search feature allowing for google, bing, yahoo, and even wiki, eBay and amazon! It is nearly as fast as safari. You can also choose from seval themes. It has tabs and bookmarks and reminds me of a Firefox chrome hybrid. Recommend it to anyone with iPad. Firefox because it’s safe, reliable, and fast. Also, it is just plain awesome. Chrome. Its simple, clean, add-ons work, more convenient, etc. Firefox is also a great web browser and have been using that for years before Chrome. I’ve used many web browsers, but hands down the best is Safari. Chrome is by far my Favorite, and the new features will just keep coming. although IE9 is actually looking pretty beast, and I HATE IE. Safari is the only actual browser because apple doesnt allow competative browsers into the market. Hands down the best is Safari. I prefer opera because I can open up the browser leaving almost nothing at the top, giving me more room. I just use the mouse gestures which may be annoying at first, but you get used to them. its fast too. Safari on XP, because the lay-out and ease of use is nice. when I first had this PC I went to Mozilla Firefox and never used IE. Then I saw Safari and I’ve used it ever since. I’ve used Chrome since it’s release. It’s been fast and reliable, and has all the features I need packed in. I’ve tried all of the ones mentioned here except for Opera. Firefox has always been alright… but never great in my opinion. Safari had some decent speed, and ok reliability, but I found the UI to just be far too clunky and confusing. And of course IE I have never liked since exploring other browsers( pun intended). Yet, IE9 has me convinced, that Microsoft is listening to their customers, and really innovating. The RC for IE9 is the most impressive browser since Chrome to me. Chrome and IE9 are the only 2 browser that have ever had that “wow”-factor to me. Chrome is the absolute best! You should put a poll up for people to vote on. I prefer to use Chrome in os x. As far as speed goes, i can´t really say i see a major difference in speed between Chrome and Safari. The best thing that Chrome has right now is syncing. Need to reinstall/ install on other system? Easy! Just fill in your google account and all bookmarks and extensions are there, ready to go! It´s to bad that you can´t choose to sync your Chrome bookmarks via iTunes to iOS in os x. If and when Apple fixes MobileMe they should incorporate this style of thinking, and also but the tabs in Safari on top while there at it. I also have Firefox installed (Who doesn´t?) and use it for banking. I use Chrime for it’s simple look. There isn’t thirty little useless firefox gadgets everywhere taking up half your screen and there is only one search bar. It is faster than any browser I’ve had and I’ve tried them all. chrome still has the theme customizability of firefox, but has the speed of something I could never have imagined. There are a few page crashing issues but with every new release I can see them significantly reduced. It has the basic bones of a browser, with tabs, a search bar, and tabs. All the tools and options are out of the way in the corner. I wish I could have a chrome app on the iPad or iPhone. I would never use mercury or safari ever again if they did. Firefox is great, but it is slow. Very slow. Unbearable slow and you get half the browsing area as chrome with all the useless add ons. When I browse I browse. Chrome is the most simple thing ever and I think that is the reason it is so fast. go Chrome or go home. I meant tabs, search bar and bookmarks. My primary web browser would be Firefox and Google Chrome. I love google Chrome’s blazing fast speed. I used to use safari loved the UI but got sick of it after a while. Lastly, i use opera sometimes but rarely. I never use IE. I just switched to chrome last week. I was a long time firefox user but, I have to say chrome is faster and looks better. Laugh all you want, but I use FireFox simply because it’s open-source. But, for when firefox is acting up, I also have safari, opera, chrome, omniweb, camino, and a simple homemade browser, just in case. 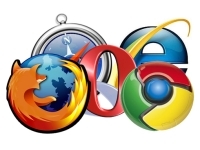 It is great to see a pretty fair and balanced look at all of the browsers. I do have one correction though. Opera has had private browsing for quite some time. In fact Opera enables you to open a new private tab within a regular window. Not even Chrome allows this.